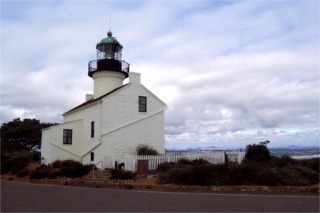 This is a picture of the Light House at Point Loma. It is actually on the grounds of the Cabrillo National Monument in San Diego. 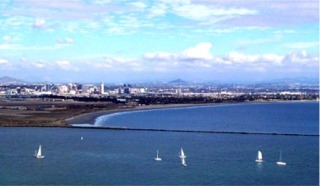 The two sides of the Point Loma Peninsula offer ocean views from one side and downtown views from the other. The light house was built in the 1850's. It is a bit different because the tower is actually built in the middle of the light keepers house. 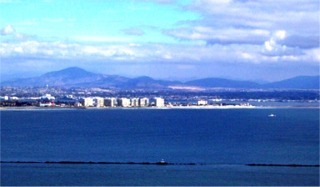 This is a view from the San Diego side. The views from here are quite stunning. I have no pictures of the ocean side because my camera will not take photo's well pointing towards the sun. 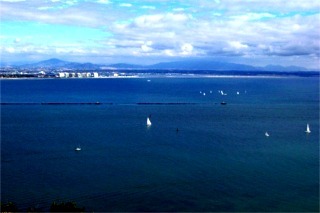 It was taken in January so the gray whales were migrating. You can actually see the whales from the shore. You will see the water spout when they blow air out. Then you need binoculars to actually see the whale. What you see is a rippling of the water. The whales migrate from the cold waters in the Bering straight to the Gulf of California where the waters are warmer and saltier. This is where they will give birth. The warmer saltier water makes it more buoyant for the young before they migrate back north again.